I have shared on my Facebook page about the CNIB Night Steps, and asked you to support me in raising money for this amazing organization. I thought with the walk approaching on September 26th I would tell you a little bit about why I am asking for your support and what they have done for me. As many of you may know I was born legally blind, I was first introduced to the CNIB when I was in grade 4 so I was about 8-9 years old. This was a major thing for me. Their involvement in my education meant that I was able to be on a more level playing field with my peers and learn the skills that are so necessary for my daily life now. They assisted in everything from getting me a computer (this was a bigger feat when I was a kid since computers were not as popular ), I learned to type and do basic functions on a computer, I had all my books and handouts enlarged so that I could easily see them. As I got older and moved to the high school they were much more involved by helping get me the services that I needed. In high school I learnt Braille, and Orientation and Mobility (white cane and independent travel), as well as Independent Living Skills (ILS) which taught me how to cook and and other daily living tasks such as cleaning, laundry all that day to day stuff that needs to be done. When I went to University they were there to help teach me how to get around the University and give me the tools I needed to be successful. The thing that has always amazed me is that whenever you encounter a problem with your vision and something you want to do you can call them and they will be there to help you figure it out. As my vision has changed over the last few years they have been there every step of the way to help me figure out how to cope with the new changes and teaching me new things that I can do to make things easier. They were also a huge part in me getting Rick my Guide Dog they were there to help me through the process and give me the skills to qualify for a Guide Dog as well. The CNIB is a integral part of any blind or partially sighted individual, whether you lose your sight as an adult or are born blind you will need the services of the CNIB. The main part of their funding to provide these needed services to Canadians is the generous donations of the public. Without the CNIB there would be none of these services provided. If you are paralyzed in an accident you will be rehabilitated through our health care system, if you go blind in an accident you will not be rehabilitated through our health care system, you will need the services of CNIB. 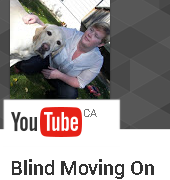 Please consider supporting me and the thousands of other Canadians living with vision loss ! It will be a great time !! Rick and I will be walking and raising money to support the services of CNIB !!!! Hope to see you there ! I hope everyone is well. Recently my husband and I took a trip to Las Vegas Nevada to see my little sister get married. We had a good time I was a little nervous about the amount of people and how Rick would do. I was right to be nervous not because Rick had a hard time but because people are rude, and inconsiderate. There were a few times that I had to go back to our room and take a break because I could feel my emotions getting the better of me. The reason for this is because people have no filter. It was hot out the pavement was hot, so Rick was wearing boots when we went for a walk on the strip every second person was saying “oh my god that dog has boots”, “why is that dog wearing boots”, “that poor dog has boots”, and on and on. I had a few people point out that I was blind or didn’t look blind and so on. We had only been on the strip for about 2 hours and it was even starting to get to my husband. I am not sure why people think this is ok. We are not an exhibit at the zoo, I am aware that my dog is wearing boots, I put them on him. I am aware that I am blind hence why I have the dog. I am aware that my eyes are not cloudy, that is because I do not have cataracts or any of the other conditions that cause that. Now I would never walk down the street and say “oh my look she has purple hair” “oh my her shorts are too short” “oh that poor girl has to wear braces” . I know many people are intrigued by my Guide Dog and that is great but don’t forget that there is a person behind that dog, a person that has feelings a person that can hear you quite fine. If I must remind you it is my eyes that don’t work my ears are great. It can be very hurtful when people including family will say hi to my dog and make a fuss over my dog and don’t even say hi to me. If you come across a Guide Dog and their handler ignore the dog ask them how they are, they are aware their dog is cute, they are aware their dog is wearing boots, they are aware how smart their dog is. We are people and like to be treated as such !